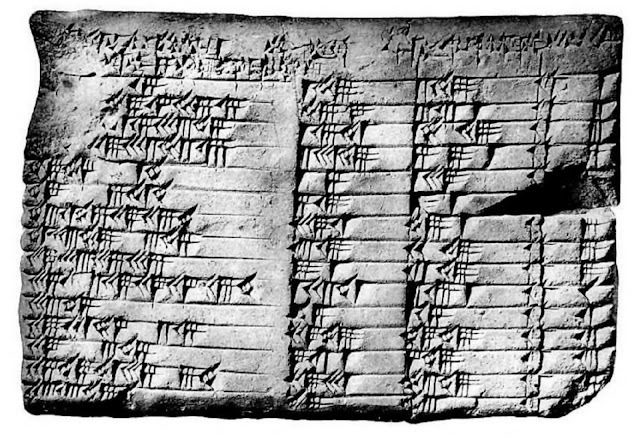 Plimpton 322 is a 3,700-year-old Babylonian clay tablet, that has a sophisticated set of trigonometric tables inscribed in the base 60 mathematical notation that the Babylonians used. It includes extensive use of Pythagoras Theorem and Pythagorean triples (3,4,5 is the simplest but the table includes less obvious triples such as 119, 120 and 169). It has just been fully deciphered. Story in the Guardian HERE.